We are delighted to be part of the official launch of Amy Geddes’ Fyne Fiddles (Book and CD) on Saturday 25 November 3-5 pm. 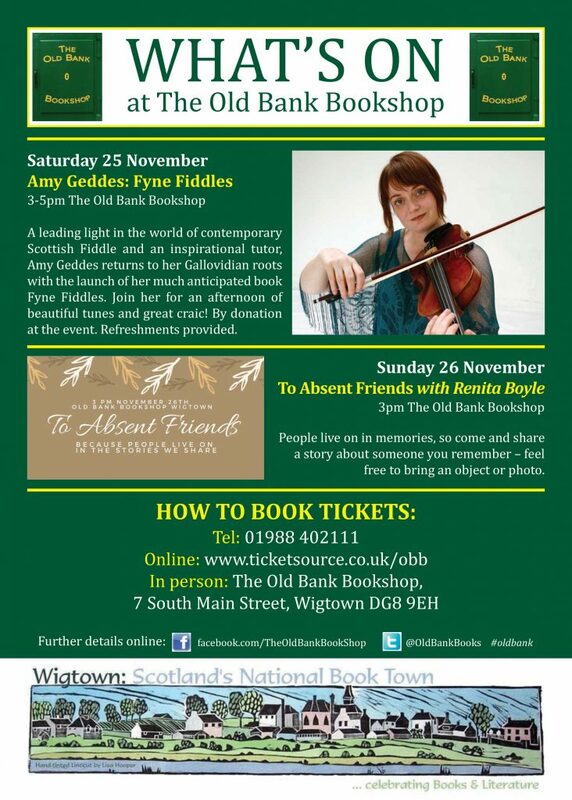 A leading light in the world of contemporary Scottish Fiddle, and an inspirational tutor, Amy returns to her Gallovidian roots with an afternoon of beautiful tunes and great craic at The Old Bank Bookshop. By donation at the event. Refreshments provided. On Sunday 26 November 3pm there will be a chance to remember absent friends with storyteller Renita Boyle. Come share a story about someone – feel free to bring an object or photo. Free, but ticketed. We very much hope to see you over the weekend of 25-26 November – the same weekend as the Winter Kist, so hopefully a busy one! You are welcome to share the attached poster among your networks.